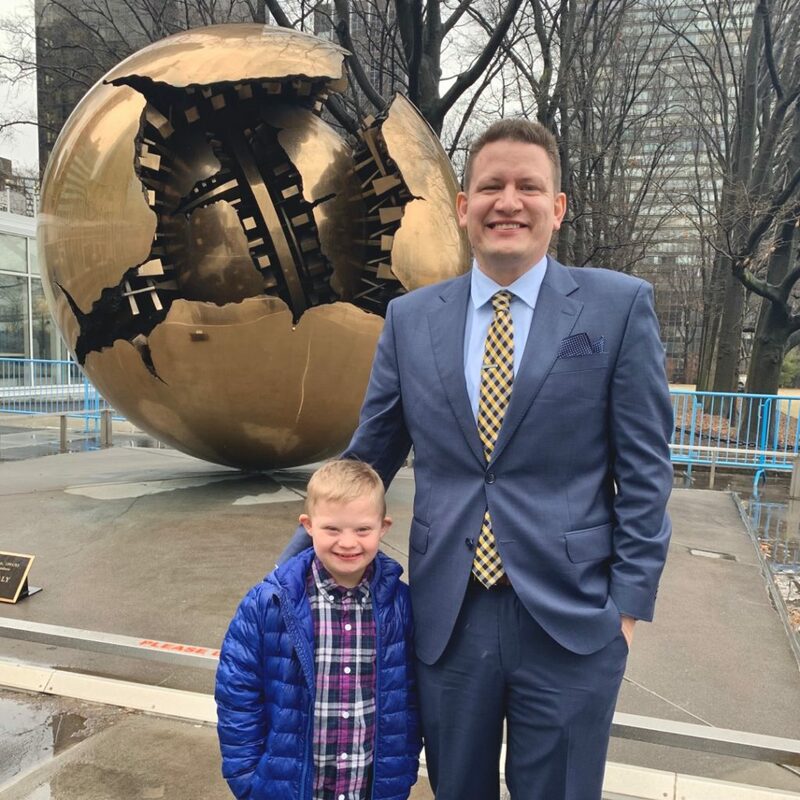 Last week on World Down Syndrome Day I had the unique privilege to speak on a panel at a conference being held at the United Nations in New York City. It was an honor to be a part of this panel, and to be able to share about the important work Hope Story is striving to do with those in attendance, and who were / are able to watch online. 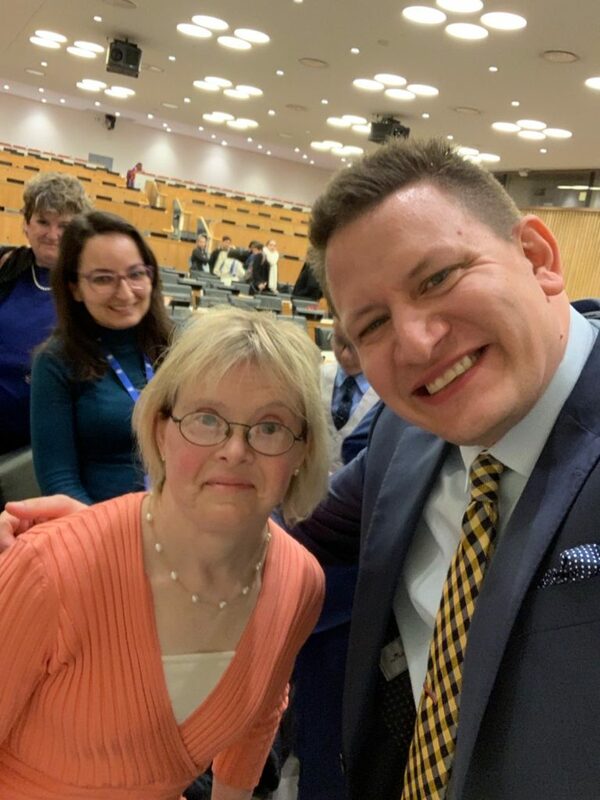 During my talk, “A Little Bit of Hope Can Go a Long Way – Bringing Hope and Support to Couples Receiving Pre-natal Diagnosis of Down Syndrome,” I shared one of the biggest problems facing people with Down syndrome and how Hope Story is working to solve it. Will you please take a few minutes to watch the talk by clicking play on the video below? In the video you will hear about the problem I mentioned above, how Hope Story is working to solve that problem, and how (if you’re a parent of a child with Down syndrome) you can help us! 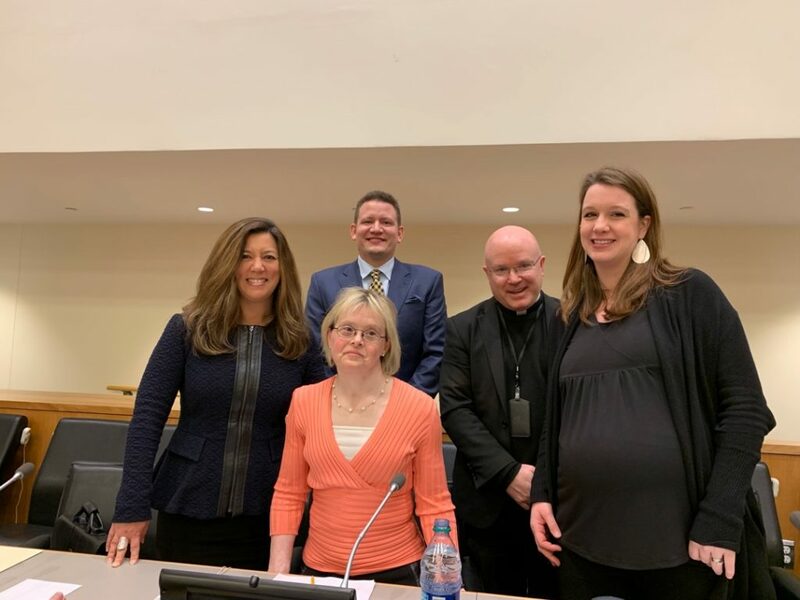 I had the opportunity to be on a panel with so many great speakers including Michelle Sie Whitten, President and CEO of Global Down Syndrome Foundation; Deanna Smith, author of Motherhood Unexpected, and Karen Gaffney of the Karen Gaffney Foundation. All of the panelists were so kind, and you can watch all of their talks (which I recommend) by clicking here. As I mentioned, all of the speakers were fantastic, but the real show stopper was Karen Gaffney. It was such an honor to meet Karen Gaffney! I want to think the Holy See and The Center for Family and Human Rights (C-Fam) for allowing me to be a part of this conference. 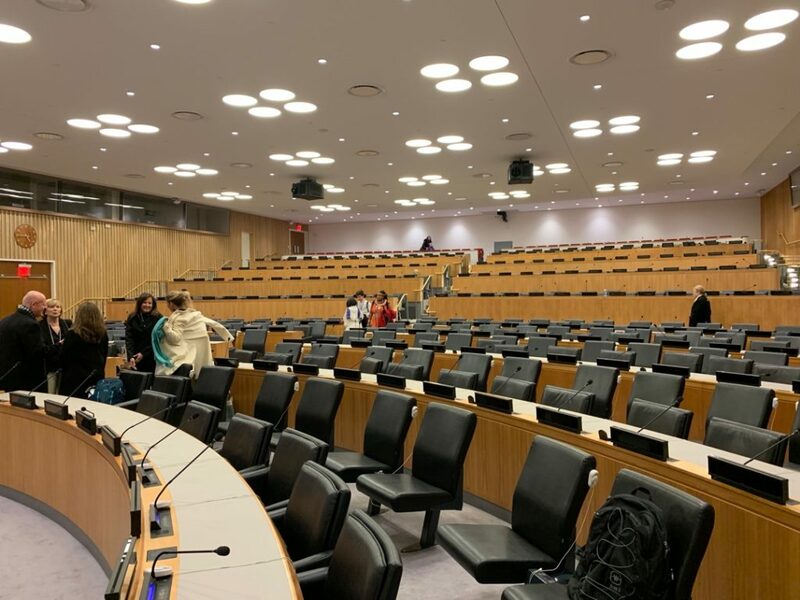 It was an honor to share about our work at the United Nations, and I’m excited about what’s in store for Hope Story. If you’re the parent of a child with Down syndrome, please click here to learn more about becoming a Hope Advocate. Also, please click here to sign up to receive emails from Hope Story. This is the best way to stay connected to what we are working on. We are working on some great things and I can’t wait to share with you more about them soon! Stay tuned. Your excellencies, distinguished fellow panelists, ladies and gentlemen, thank you for being here today on World Down Syndrome Day. I also want to thank the Holy See Mission and the Center for Family & Human Rights for co-sponsoring today’s event. It’s my honor and privilege to share with you today. I want to explain to you what you just saw in that video, but before I do, I want to share with you a little bit about my story. This is a picture of me holding our son Noah for the first time. We were surprised to learn about three hours after his birth that he was born with Down syndrome. Shortly after that picture was taken our OB-GYN left the hospital without telling us that Noah had Down syndrome, and instead our pediatrician made the drive up to the hospital to give us Noah’s diagnosis. The next morning, when the OB-GYN that delivered our son visited us in the hospital one of the first things she said to us was “I’m so sorry” followed by an offer to prescribe my wife antidepressants (which she declined.) Sadly, we never received the standard congratulations offered to new parents, and congratulations are always in order when a child is born. Our OB-GYN may have been sorry about our son, but we were not. This is our family today. That is Noah there in the middle, he’s eight years old now and is one of the biggest blessings in our life. In fact, we wouldn’t change one single chromosome on him (except maybe the chromosome that effects how stubborn he can be sometimes, but my mom would likely say the same about me.) You also see our five-year-old Jaxten, our one-year old Koen, and their mother, my beautiful wife, Abbie, who is also a hard working pediatrician. What I want to do today is tell you about a big problem. The problem is that a lot of people who find out they are going to have a Noah after the results of their prenatal testing, do not have a family picture that looks like this. You see approximately 67% of mothers who learn after prenatal testing their child will likely be born with Down syndrome choose to abort their child. This view that children with Down syndrome are unworthy of life does not just effect children in the United States. In some countries it’s considered a curse to have a child with Down syndrome. You may have heard how Iceland is basically trying to eradicate Down Syndrome. Here’s what you need to know about that. I’m all for eradicating cancer, or the flu, or headaches, but when we talk about “eradicating” Down syndrome, we aren’t talking about eradicating a disease, we are talking about eradicating an entire group of people. People like my son and his friends. So why are these termination rates so high? This is our friend CC. When CC’s mom was pregnant with her, her doctor tried to convince her several times to abort her baby. While CC’s mom was late in her pregnancy her medical professional told her that he knew doctors that would still terminate if that’s what they wanted to do. He cornered her without her husband present, asked her if that was what she really wanted, and suggested that he had a nurse that was very Catholic, but still had decided to terminate her baby with Down syndrome. She changed OB-GYN’s and today CC is a fun-loving little girl, adored by her family. These mothers had a negative experience with their medical professional, we had a negative experience with our medical professional, and as I have interacted with other parents of children with Down syndrome, I have found that sadly these experiences aren’tuncommon. It’s confusing and harmful for a new parent to receive that sort of negative responsive from their medical professional after receiving a down syndrome diagnosis for their child. I don’t necessarily believe prenatal testing is the problem. In fact, I believe it can be helpful in many cases. I believe a large part of the problem is the negative interpretation of a Down syndrome diagnosis by medicalprofessionals, which effects the way they deliver that diagnosis to their patients. In fact, I believe these negative interpretations, and interactions with their patients, are a contributing factor to parents terminating their child. I don’t believe medical professionals receive adequate training on how to deliver a Down syndrome diagnosis, and therefore aren’t able to deliver that news to families with accurate information in a hopeful way. I don’t believe most medical professionals have a personal relationship with someone with Down syndrome. Many of them don’t have firsthand knowledge of what it is like to be the parent of a child with Down syndrome. Which, by the way, most parents that I know raising a child with Down syndrome would say that while it is a unique journey, it’s certainly not a sad one. So, you basically have a good number of OB-GYN’s delivering this life changing news to a family, yet they have neither the most accurate and current information nor any personal experience of what it’s like to live life with someone with Down syndrome. They see Down syndrome as an anomaly, and a negative thing which is to be avoided if at all possible. I’m a huge fan of medical professionals. I’m married to one. We have a perinatologist on the board of our non-profit, as well as an entire medical advisory board. I don’t think most doctors have bad intentions, I just believe no one has ever come alongside them and told them what a beautiful story it is to be the parent of a child with Down syndrome. Last year we started a non-profit called Hope Story with the goal of solving these two problems. Here’s how we hope to do it. We believe that personal relationships, plus training and resources for the medical community, result in lives saved for children with Down syndrome. We call this the Hope Advocate Process. 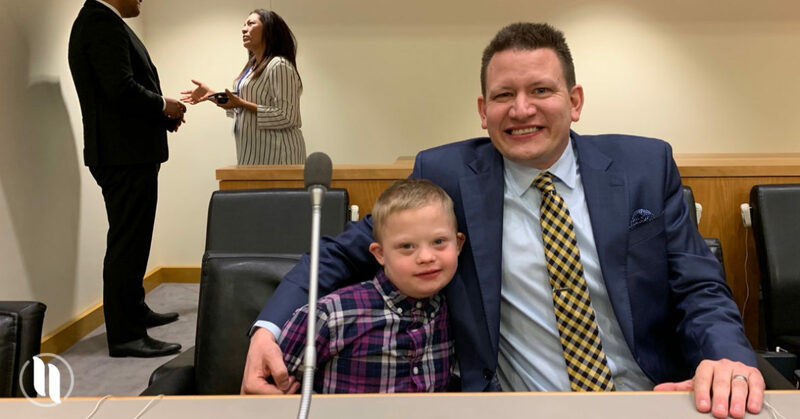 Our goal is to connect every OB-GYN in America, and maybe one day every OB-GYN in the world, to a family raising a child with Down syndrome, who can provide up to date educational resources to them as well as to serve as a personal resource to them and their patients. We recruit, train, resource, and encourage these parents, who we call Hope Advocates. Briefly, here’s how it works. A family who has a child with Down syndrome will sign up to become a Hope Advocate by visiting HopeStory.org, entering in some information and uploading a few pictures which we use to create a personalized Hope Kit for them. They receive the Hope Kit, deliver the resources to their OB-GYN at their next appointment, and share their personalized Hope Announcements which has their child’s pictures and highlights from their last year on it with them. The Hope Advocate also leaves personalized contact cards with their Doctor that can be passed on to any of their patients when they inform them that their child will likely be born with Down syndrome. The Hope Advocate can tell their Doctor that they have been trained and they are ready to talk to any of their patients, at anytime, 24 hours a day to offer friendship, support, and most of all, a connection of hope, to them. The new parents can come to our website where they can view stories of families raising children with Down syndrome and learn more about our organization. Eventually, the goal is for the new parent to contact the Hope Advocate, who will be trained to share their story of raising a child with Down syndrome with them, which in turn we think will give them hope. I think a lot of new parents feel alone. Their doctor seems to view having a child with Down syndrome in a negativeway, they may not have any friends who have a child with Down syndrome, and they likely never pictured themselves as the parents of a child with Down syndrome. When people feel alone, they can also feel fearful and hopeless, and people don’t often make the best decisions when they feel hopeless. Our hope is these connections can replace some of the fear that a new parent may have with hope, and a little bit of hope can go a long way. We want every parent whose child receives a Down syndrome diagnosis to have a friend who can sit across the table from them and tell them they aren’t alone. Ultimately, we hope the new parent brings their child to full term and the Hope Advocate process can continue. What you saw in the video before my talk is what we think this process can look like, and what we hope to duplicate across the United States and hopefully one day, the world. The Bible tells us that God knitted this little boy together in his mother’s womb, and that He was made in the image and likeness of God. This little boy is fully human and has profound worth, dignity and purpose. You see a person’s worth doesn’t come from how many chromosomes they have, or don’t have, or what they can or can not do, but because they are image bearers of the One who created them. And because of that truth, every person in every nation is worthy of life. When you walk in to a book store and browse the aisles you are greeted with rows and rows of book covers, all longing for you to pick one of them up and enjoy it. Often, we judge these books by their covers. If the cover looks attractive, and fun, and well designed, we pick it up, if it doesn’t we may walk right past it choosing to never experience the story contained in its pages. It’s been said you should never judge a book by its cover because in doing so you would miss out on the joy of reading many of life’s classic stories. Being a parent of a child with Down syndrome is like reading a classic novel that I never knew I wanted to read. In the book store of life I have to admit that I would never chosen to pick up the story of raising a child with Down syndrome based on the cover, but now that I have experienced this life changing story that I never knew I wanted to read, I’m SO glad I have, and I can say that this story has changed my life, and the life of countless others – for the better. And just like any good story, I want to share it with others so that they will not miss out. Sadly, so many people in life make a choice to close this book before they ever turn a page. Our goal is to help more people not miss out on the joy and beauty of this story by helping replace their fear with hope. I think the Hope Advocate process has the ability to literally change the world.If you’d like to learn more about how you can help us bring hope to others please visit hopestory.orgwhere you can also send me a message via the contact form on our website. It would be my privilege to connect with you. Thank you for your time, and I hope you will enjoy us in connecting medical professionals and families to stories of hope.